The Ann Arbor city council has formally objected to the renewal of the liquor license for The Arena – a bar located on the northeast corner of Washington and Fourth in downtown Ann Arbor. The action came at the council’s March 18, 2013 meeting. Jane Lumm at the March 6, 2013 hearing on the non-renewal recommendation of The Arena’s liquor license. She served as hearing officer. The basis of the objection to the renewal, which will now be forwarded to the Michigan Liquor Control Commission for final action, was The Arena’s failure to pay a combined $8,755 of 2011 taxes and an additional default judgment. The default judgment was made in the 15th District Court by then-judge Julie Creal in favor of the city for $1,659. It involved non-payment for police services. 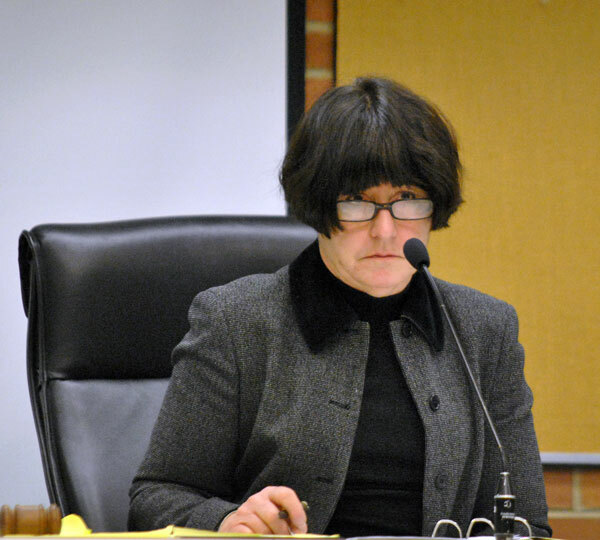 A hearing on The Arena’s liquor license renewal was held on March 6, 2013 – presided over by hearing officer Jane Lumm, who represents Ward 2 on the city council. Based on evidence presented by assistant city attorney Bob West, who called city clerk Jackie Beaudry and city treasurer Matt Horning as witnesses, Lumm concluded that the recommendation of non-renewal should be placed on the March 18, 2013 city council agenda. Also on March 6, 2013 a hearing was conducted on the non-renewal of the license for Banfield Bar & Grill. Lumm issued a similar verdict on that case, but in the meantime, Banfield paid the taxes owed. So Banfield was on the council’s agenda with three other establishments that were recommended to have their licenses renewed. The three other establishments recommended for renewal by the council on March 18 – all of which had rectified any issues prior to the March 6 hearings – included Aut Bar, Bagger Dave’s Legendary Burgers & Fries, and Café Zola.